Although heartburn is the most common symptom associated with GERD (Gastroesophageal Reflux Disease), it nevertheless, may be caused by several factors that include Hiatal Hernia, obesity, asthma, pregnancy, peptic ulcer, diabetes, delayed emptying of stomach contents, connective tissue disorders and a few more disease conditions. However, a singular condition that is universal among most GERD cases is the weakening of the lower esophageal sphincter muscle. GERD risk factors include hiatal hernia or diaphragmatic hernia, in which, part of the stomach crosses its boundary and comes protruding into the lower chest. GERD related to hernia is bad when the protrusion is large enough to weaken the lower esophageal sphincter muscle. And when this happens, the stomach contents including the acid get back into the esophagus, thus creating severe heartburn. Obesity can also lead to GERD. Obesity puts extra pressure on the stomach as well as the diaphragm that separates the abdomen from the stomach. This opens the lower esophageal sphincter, and as a result, the stomach acids go back to the esophagus, causing heartburn and related discomfort. So lose weight to avoid GERD. Our lifestyle or certain habits also contribute negatively. For example, those who smoke, drink excessively or overheat are prone to suffer from GERD. Asthma also includes the list. Though asthma may not be directly related to GERD, some asthma medications that dilate the air path to provide relief also dilates the lower esophageal sphincter muscle, thereby allowing stomach acids to get back into the esophagus. This naturally, enhances the chances of getting affected. Some are also of the opinion that GERD risk factors are made worse due to the excessive coughing and problems in breathing - that all puts extra pressure on the stomach. Pregnancy is another cause of GERD. Pregnant women often become victims of GERD as this too causes extra pressure on the stomach. The condition is worsened because it triggers a much higher production of a hormone (progesterone) that loosens up several muscles including the lower esophageal sphincter muscle. GERD can be treated using both conventional drugs as well as holistic remedies. However the fact is, conventional drugs are able to address just the symptoms of the disease, when it comes to the risks of GERD, but the root causes of the disease remain unattended. Holistic remedies on the other hand, in an effort to treat GERD risk factors, aim to treat the contributing factors, and are thus more effective in reducing or eradicating GERD. GERD is complicated and the causes are also many such as Candida infections, dietary patterns, lifestyles, and also genetic traits. So it is important to treat the body as whole, and this is what holistic remedies do. This is why holistic remedies are so effective in the treatment of GERD. 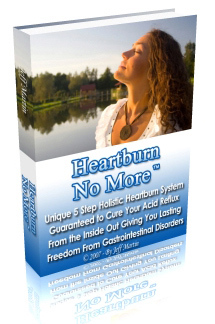 Discover The Only Clinically Proven & Unique 5-Step Acid Reflux Healing System. Permanently Eliminate GERD Within Two Months.